A boon to the bbq set, these all-time beer classic may look like crystal but they're not. They're shatter-resistant and won't crack or break no matter how lively the party gets. Set of 4 Margerita Glasses. What is their composition? Acrylic? Wash up great with little or no smears. 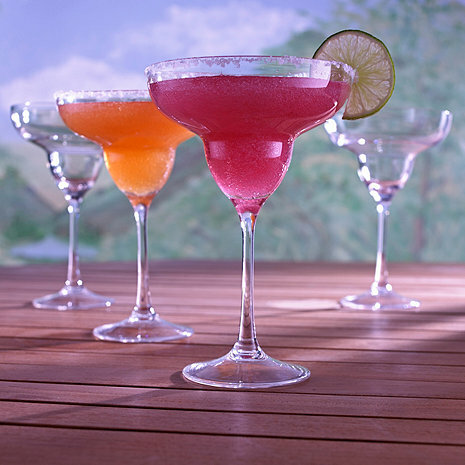 The Indoor/Outdoor Margarita Glasses (set of 4) are made from food-safe, shatter-resistant Eastman Tritan Copolyester (BPA-free/FDA-approved). BEST ANSWER: Thank you for your question, the Indoor/Outdoor Margarita Glasses are BPA free. THESE GLASSES SOLVED THE PROBLEM OF WANTING THE RIGHT GLASS FOR THE BEVERAGE BUT NOT WANTING GLASS AROUND OUR POOL AND DECK AREA. THANKS!